I'm so happy you're doing this again. What a wonderful resource. 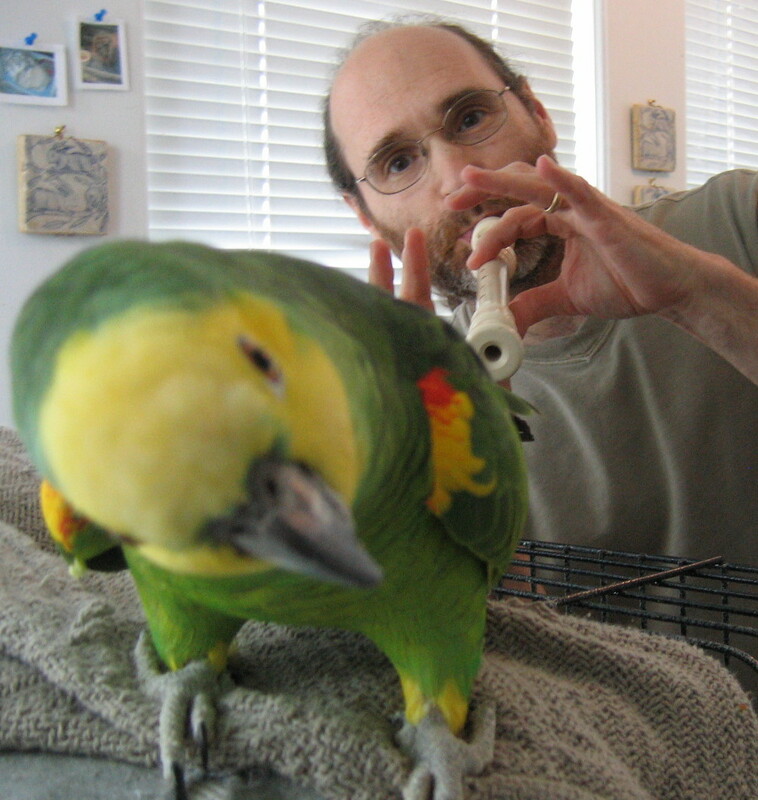 I remember one of our first lessons ages ago, I was frustrated that my embouchure didn't feel the same day to day. To this you said, "What time did you get up this morning? 9am? Well since then, the planet has been moving at 66 THOUSAND MPH into a place in space it's never quite been. What makes you think you're little spec of a life (and it's embouchure) on this giant planet is going to be the same every day? Are bodies are always in a state of motion and change. We have to be sensitive to those changes and change or adapt with them. In that, is consistency!" I've never forgotten that. I thought that was a good memory in light of this video. Thank you Jim for this addition. It is so true and I'm glad it has been useful to you. It does have to do with attitude. That attitude for me is an acceptance of a real fact that I can work with. The body, emotions and our minds can be affected by all sorts of change, cosmic and more local! But our love and desire to improve and develop can always be there and in that there is change too! The classic phrase "Go with the flow" can come in useful in this context. It is amazing to think of how fast the universe is moving changing! And since we are a part of the universe in a micro-form, it is happening to us on our level of life and that is where the consistency is! That causes great awe in me and awe is something I always want as a part of my attitude alignment. Best to you Jim and thanks for this! This lesson was extremely valuable for me. I found that when I thought about air pressure and pitch, tone, rhythm, and character that my playing improved. As you explained in the video, prior to this exercise I was not balancing my practice room goals efficiently. Glad it is useful for you Isaac. It so easy to go into the practice and an hour goes by with not much accomplished. Look for small improvements. Small is still worth something and is a good attitude to have too! This three point exercise can be very beneficial in fine tuning our focus. You might find out that if you think air pressure, rhythm and tone is an excellent combination. Try it all different ways with making sure that air pressure is the constant. Hi Norman, thanks for doing this again this summer! I thought it was interesting what you said about improving over the summer, even if one doesn't have the opportunity to attend a summer music festival. I actually tend to think the OPPOSITE of that statement...improving DESPITE the fact that one is at a summer music festival. For the last two years, I've attended festivals and after I got home, I felt like I had lost overall ground from where I was when I started the summer (some things, like orchestra playing, were better, but many things wound up feeling much worse). This summer, I am attending another summer festival, but the most up front tuning in me is to keep my will alive and to make sure that this summer IS a time for improvement overall, and not a time to only improve at playing in an orchestra. So I just wanted to put that out there for anyone who might find it useful to know that my experience has actually been that summer festivals can be a huge chunk of 'kryptonite' to one's music making. That being said, I will try these practice methods this week and see how they feel! I think the format of doing one topic per week is really useful, as it does give everyone a chance to experiment and try things. Or, if someone's schedule is very busy one day, they could watch the video a day after it is posted and still not get behind. Thanks again, and I'll report back about how this week's practice goes! This is a great resource for everyone. Since reading your blog a couple of days ago I have focussed on what my attitude is doing during practice times. I noticed that it shifts around depending on what I am practicing. Some pieces of music I have practiced a lot are often difficult for me. When I stop to think about it I realize that my attitude toward these pieces, for various reasons, is poor. It's interesting to realize that the pieces aren't always the most technically or musically challenging. They are a problem because of all the hours I logged in practicing them with a poor attitude. Sometimes I have to put my thoughts down on a page to clear my mind. This helps some. If you have any suggestions on what you do for this it would be very helpful. Thanks for your comment Ross. In the 3 step method air pressure is the constant. Desire and artistic goals need to be the constant pressure regardless of where one is or what one is doing. For example, the artistic goal pressure (AGP) and summer music festivals, AGP and college, AGP in the practice room, AGP in the concert, in the rehearsal, on the weekends. Whatever one is engaged with the overall attitude-desire-artistic goal alignment is the constant like air pressure is in this little practice method. Other words for the constant pressure could also be used like love and passion. If you are staying connected to your purpose pressure there can always be insight and the opportunity for improvement at any level, physical, mental, emotional, atmospheric etc. at any moment! Hi John and thanks for your comment and excellent question. When practicing something we have done over and over again, i find it useful to make sure I am connected to it before playing it. That might sound obvious, but we all know how easy it is to just play stuff by putting it on automatic pilot! Our automatic systems will replay everything we put into them on a regular basis. Things get into us consciously, semi consciously and unconsciously. So we are not always aware of what is getting into us. That is the great value of taking the time to feel where we are at with a piece no matter how well we think we know it. We have to come to some peace with the various pieces that we play. Also, if we are feeling stuck, play the piece in ways that you would never think about playing it! This can help an attitude from developing about a particular piece. I like the example of Rochut etudes. Most often when I hear people play Rochuts it sound like they have a fixed formula that they play any Rochut with. That says something about the attitude and concept they have about these etudes. Play a jazzy Rochut, an aggressive nasty Rochut, play a Rochut short and accented! I'd venture to say most people have not done this! It would be sacrilege to some people to play a Rochut short, accented and aggressive! No it would not! Remember it's the reason why you do something that makes it worthy or not. And sometimes we need to break out of old habits, attitudes can become old habits too! Anything can if we do it on a regular basis. Sometimes we have to search to find better and more useful ones. Doing things differently can help see where we are stuck. Writing things down on paper can be very freeing and telling! Often times you can see where the approach and/or attitude needs an update. Old associations die hard. But with always being in touch with the piece before you play it helps to keep you more conscious of what you allow yourself to be influenced by. Questions like, "What does this piece mean to me?" or "How does this piece make me feel? ', can be a way in. Hope this is useful John! Keep writing your thoughts on paper. It is an excellent technique. Really great stuff, Norman! Thanks for giving so much of yourself!